Grob Aircraft a German aircraft manufacturer had the great pleasure of hosting and training their first ever African clients from Kenya. 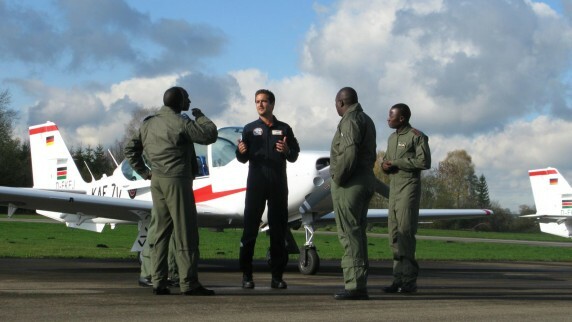 Four Kenyan pilots were hosted by the company for training on using the aircrafts and to go on trial flights before they can eventually fly the aircrafts back home on a 25hr flight. Major General Jofidha Otieno, head of the Kenyan air forces, was also with the group in Mattsies to pick the machines. He was impressed by the punctuality and the precision shown by the workers of Grob Aircraft in their delivery of the agreed products. “We can hardly wait, to have the aircrafts delivered in Kenya”, Major General Otieno told the Augsburger Newspaper. The Kenya air forces have ordered six machines from Grob Aircraft. Three of them are second hand with a mileage of about 3300miles while the other three are brand new and were custom made for the Kenyan team. Although Major General Otieno and his team were to be trained by the Grob aircraft engineers and pilots, they would also get on site support back in Kenya offered by the same company. The four airforce pilots will be accompanied by the Grob Aircraft pilots for the flight to Mount Kenya. Grob Aircraft has made a name for itself in its niche market in military aircrafts and seems to be growing bigger. This was the third major client this year alone and early next year, they will be delivering more aircrafts to the British military forces.